Security gates fit over dock doors, lift-up doors, hallways, and entranceways. They improve security, prevent unauthorized access to restricted areas, maintain ventilation to the building, and provide guards and managers with visibility in both directions. They are used for in a broad range of commercial and industrial applications. Major factories major factories, shipping operations, railways, airports, military bases, warehousing complexes, retailers, schools, universities, hospitals, medical laboratories, and office buildings all use security gates to maintain a more controlled environment at all times. Security gates are made from 3/4" wide 14 gauge steel channel that has been riveted together back to back. The upright rails of the gate are hot rolled angle iron that prevents the gate from being pushed or broken through. To prevent the gate from being bowed inward or pressed down from above, a drop pin in the center of the gate immobilizes it in the center and provides extra strength and stability. Easy Rack gates can be ordered in four standard model types that can be further customized to fit uncommonly sized access points. Every gate includes a locking bar that allows you to secure the unit with a padlock, and every gate will pivot 180 degrees pivot out of the way when not in use. Please keep in mind that it is normal for the gate to drop approximately one inch in height when it is extended across the doorway. 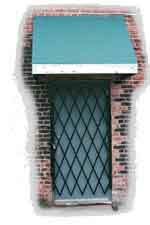 When ordering, add one inch to the height to the standard gate measurement to compensate for this slight variation. Door gates are made to fit over door openings that measure 24" to 48" wide and 61" to 83" high. They are commonly used in office buildings to restrict access to doors in the backs of building. Gas stations and convenience stores also use them to protect their storage areas. Door security gates are manufactured with a reversible hinge design that allows them to be mounted on either the left or right side. You can either mount them in the door casing or in door opening itself. f or over the door casing. The lead rail of the gate is manufactured with a ball bearing caster that allows workers to easily extend and retract the gate. 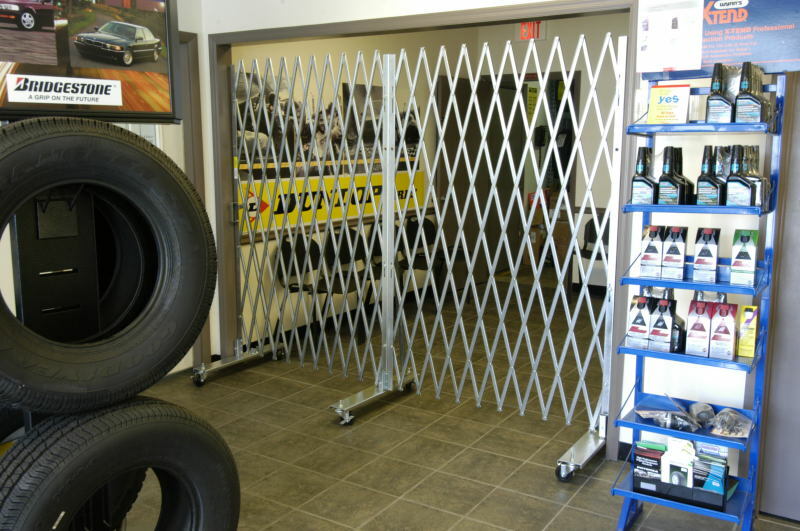 These two-piece gates will cover large industrial doors of any kind measuring up to 10’ in height. They are ideal for industrial dock doors and overhead doors that see not only a lot of worker traffic into and out of the building, but vehicle traffic as well. Easy Rack customizes these gates to fit any size width of dock or overhead door. Both sides of the gate will pivot a full 180 degrees to either side to allow safe and unobstructed access to the facility. Double security gates lock together in the middle using a standard padlock. Portable gates are used extensively inside schools and hospitals where certain areas need to be restricted after normal hours of operation. In schools portable security gates can be used to block off hallways and cafeteria areas after classes are over and students leave the building. Hospitals often use them to block off certain areas of the building at night to restrict traffic only to key hallways and rooms. Construction crews routinely use portable security gates as safety tools. Workers mount them in doorways and hallways of buildings to prevent access to unfinished or unsafe areas. 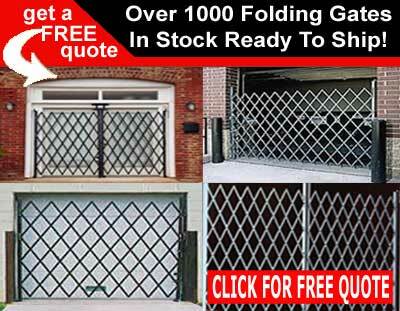 Portable gates collapse to 6 X 6.5’ when not in use and can be stored in closets or portable buildings when not in use. Easy Rack stocks a vast inventory of commercial shelving, material handling equipment, used pallet racks, and modular prefab buildings installed nationwide. If you can not find what you are looking for call us toll free at 1-888-776-3720 and we will find it for you. Our home office is located in Houston, Texas with warehouses located throughout the United States that enable us to service all 50 states including Memphis, Tennessee, Baltimore, Maryland, Charlotte, N.C, Milwaukee, Wisconsin, Seattle, Washington, Boston, Massachusetts, Denver, Colorado, Louisville-Jefferson County, Kentucky, Austin, Texas, San Antonio, TX, New Orleans, LA, Irving, Texas, Amarillo, TX, Dallas, TX, Brownsville, Texas, Grand Prairie, TX, Pasadena, Texas, Fort Worth, Texas., El Paso, Texas, New York NY, Miami Fl, Los Angeles, CA, San Diego, CA, San Francisco, Ca, Phoenix, AZ, Boston, MA, Chicago, IL.